Bush Cherry are blooming now, adding some brightness to wintry gray days! They bloom only once in the spring, but boy, do they put on a show. 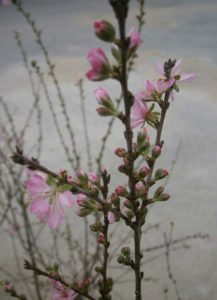 The stems are densely covered with dark pink flowers. 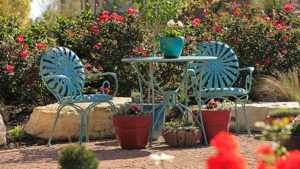 These are a nice alternative to cherry blossom trees, which don't perform well here in San Antonio. The Bush Cherry is just what it sounds like. It is a bush form of ornamental cherry growing only 4-6 feet tall and 4-5 feet wide. Growing in an upright form, you can easily tuck it away just about anywhere in the landscape. It's perfect for foundation planting, mass planting or as a hedge. It could also be used as an accent plant and looks especially pretty near water gardens. After blooming, you'll see bright green foliage tinged with red on reddish bark. In fall, Bush Cherry will get a nice yellow color before dropping its leaves. Bush Cherry can also take our Texas heat and different soil types as long as it's got good drainage. Plant them in full to part sun to make them happy. Want one? Better hurry! The Garden Center has a limited number of these babies right now. Pick up a five gallon container for $29.99. See ya soon!